Halloween is on Monday, and Thanksgiving is around the corner — as evidence, I've already received my Turkey Day copies of three of the biggest food mags: In Food & Wine, Michael Symon shows us how to have a Heartland Thanksgiving, BA wants us to try our turkey 4 New Ways (vegan is not one of them), and Saveur is focused on the sides — and yet as I look out the window at the unexpected snow falling in Brooklyn while I write this, I can't help but feel that we've skipped ahead to February. All that said, the recipe I have to share with you today has nothing to do with any upcoming holidays or monthly food mag trends. Instead, it's a simple vegan sandwich that's quick and easy to make and packed with deep, bold flavor; great with a side of chips and a cold beer during Sunday football (or a weird October snowy Saturday). The unexpected twist on this sandwich is the Harissa spread — a hot and flavorful North-African condiment made from chilies, oil, garlic and spices — that I picked up already-prepared at my local market. To start: Pour oil in a large skillet or frying pan over medium-low heat. Add the peppers and onions, season with salt and pepper, and cook, stirring occasionally, until they are soft and floppy but not swimming in their own juices. Remove from pan. Cook the Gardein: Add more oil to the pan if it has become too dry. Place frozen Gardein cutlets in the pan, increasing the heat to medium, and sear until crisp and brown on the ouside and warmed through, about 2 minutes on each side. Lower the heat and return the peppers and onions to the pan, mixing them and spreading them over the cutlets. Build your sandwich: Liberally spread Vegenaise on the bottom inside of each roll. Spread Harissa on the top inside of each roll, lightly if you prefer less spice, or with a slightly heavier hand if you want your sandwich to be really hot. Pull cutlets from pan one at a time and lay over Vegenaise on bottom inside of each roll. 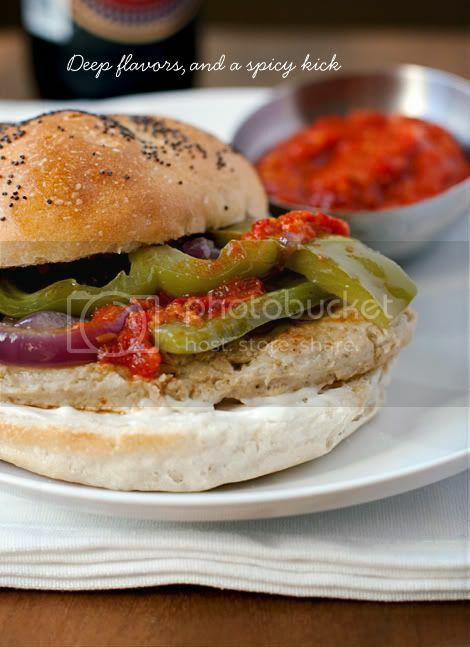 Scoop peppers and onions from pan and lay over cutlets, dividing them equally between sandwiches. Lay the top half of kaiser roll over each sandwich, slice sandwich in half if desired, and serve immediately with a side of extra Harissa.